Traditionally, phantoms that closely mimic the physical properties of various human tissues have been invaluable for the development and testing of medical imaging modalities such as ultrasound, magnetic resonance imaging (MRI), computed tomography (CT) and others. Many different tissue-mimicking (TM) phantom materials have been developed to simulate the properties of high-water-content and low-water-content biological tissues at discrete frequencies. These materials can be roughly divided into several classes, according to the base component. In this research area we evaluated the suitability of cellulose based hydrogel and acrylic hydrogel to mimic the acoustic response of a human tissue. Several different kind of biological tissue (liver, vessel, heart) have been investigated in order to compare their acoustic properties with the corresponding coming from synthetic materials. 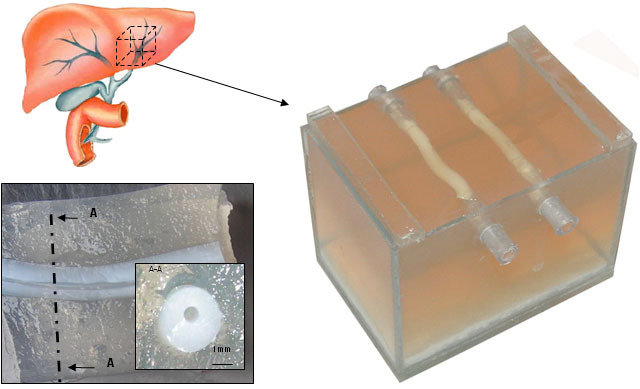 We built a prototype of a liver tissue with its vascoular system. In figure is presented the phantom we used in the investigation of experimental intravenous ultrasound contrast agents. Now the research is addressed to build this system directly by means rapid prototyping (stereolithography) starting from a CAD project.